In 1942-43 thousands of prisoners-of-war of the Japanese laboured to build the Thai-Burma railway. A large group called “F” Force, comprising 7,000 men (3,400 British and 3,600 Australians), laboured on the northern section of the railway in Thailand. With the exception of the “coolies”, this force had the highest death rate of the groups sent to Burma and Thailand. 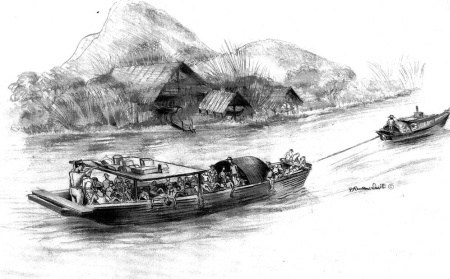 This is an account of three barge trips down the Kwai Noi River, Thailand, to evacuate 230 (Doctors Diary and Memories by RM Mills ISBN 0 646 19473 9 p 101) sick POWs from the vicinity of Takanun to the Hospital Camps of Wanyai, Chungkai and Kanchanaburi in July and August 1943. Movement from the hospital huts to the barge (which was some distance) was by the evacuees walking (shuffling), being aided by an orderly or a mate, or by carriage on stretchers etc. Frank’s recollection of the number on the barge is 50 to 60. Most evacuees were not in any condition to identify any but close colleagues. They were grateful to be leaving this Hellhole. With the degree of sickness of many of the evacuees it was frequently necessary for them to hang over the side of the barge to relieve their discomfort. Some did not survive the journey and died en route. As best as he can recall, Frank Nankervis estimates the length of the barge at about 40 feet by 8 feet with only about 2 feet of freeboard. The barge was towed down river. Being the monsoon season the river was flowing fast and the barge was often going down the river side ways, ahead of the tug. Those patients who were in a good enough condition to be aware of the circumstances, must have been concerned. Many would not have been able to appreciate the beauty of the river. There was one overnight stop. Probably at Tarsao where Sgt Hughes may have been taken off to go to Wanyai hospital camp (a short distance away). Chaplain (RC) Dolan MP QX6387 also was intended for Wanyai. Some 4 Anti Tank men (Frank Nankervis says they were from Numerkah in Victoria) were at Tarsao and one of them was dying. Frank Nankervis met up with his former batman from 2/29 Battalion Bill Forrester, who was dying. Forrester gave him his only possession a comb with several broken teeth. Forrester died 17 Oct 43 at Kamburi. All got off the barge at Chungkai. Nankervis was the only one to stay there. 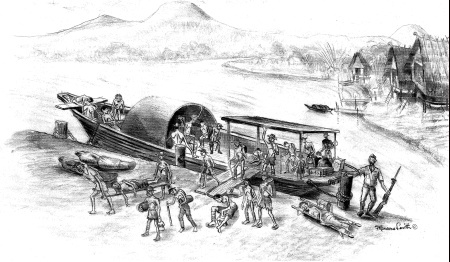 The remainder moved on to Kamburi (Kanchanaburi). This movement was by rail. At Chungkai Nankervis had contact with an outstanding Medical Officer Canadian Captain Jacob Markowitz, who was captured in Singapore whilst serving with the RAMC). Signaller Max Smith NX29700 (mentioned above) died at Kamburi 7 Oct 1943. Both drawings by Fred Ransome Smith (Lt Fred (Smudger) Smith- 5th Suffolks) and drawn 2006 from memory. I am indebted to Mrs Margaret Webster, the niece of Signalman Max D Smith (mentioned above), for providing we with copies of two letters which had been written by former Private Rex Marshall (also mentioned above) in 1969 to her late father the Rev T.G.Smith about his deceased brother Signaller Max Smith. The letters really tells much of the conditions which these men endured and about the barge trip downriver on 16th August. Relevant extracts are below. For clarity, there has been some editing of unrelated matter, some punctuation has been added, and some paragraphs have been re-ordered. This was kindly done by Margaret Webster. “One morning I met up with Pastor H.A. Brown of the Cootamundra Baptist Church. Amongst talk of Leeton, my birthplace, my POW holiday came up and the name of Max Smith, ex 8th Div. Sigs. I was telling (him) of this chap that I saw slowly head home, not happy, but a day or two before he lost consciousness he affirmed to (me) that he still wanted to be a missionary and, I gathered, back to the jokers that were not throwing the home comforts about at the time (i.e. the Japanese). I was telling at breakfast how Max still wanted to be a Missionary, (and), miserable as he was in the flesh, stuck to the resolve as he gradually lost ground. He and I were the only Christians alive at the time in that little party of sick. I joined 2/3 MAC with 6 Christians, Frank Tyas (Baptist), Bruce Gostellow (Methodist), Jim Sutherland (then a Presbyterian, now Evangelical Anglican), Brian Hutchinson (then Brethren, now Anglican Minister) and the brother (?) and I, (who) went back to the world. We were in the 8th Field Ambulance. John Ridley was our Militia Chaplain. I first met Max in Changi through other Christian contacts, forget how. We were herded up in the first F Force working party after 15 months in Changi to near Bangkok and then marched 15 nights up into the jungle near the border near Burma. There were 600 in that advance party, sleep every third night (two nights march), too hot to sleep on the ground in the heat of day, two rice only meals and a little of what we could trade for in the villages for the first few days. Two hundred and eighty of the 600 completed that march. Some dropped out and the Thais got them for their boots. Then the other parties made our number up to 600 again and we were a bridge gang with a little rice and onions only to eat. Then the wet season hit us and we starved, died and worked and walked, and cholera, dysentery, malaria and the lot hit us. Max was the only Christian I knew. I had left my mates behind in Changi through speaking out of turn against the officers robbing us of our due share of food. (There were) about 80 going to work, 240 lying there, and one day the Japs said 80 men could go downriver if we could walk to a barge. Max and I crawled up the slopes and walked on the flats. Some of the 80 on the list could not get to their feet. There was a Presbyterian private, made Padre, also with us. He later died on food, his body could not take (the unaccustomed food). I led Max into a camp near Kamburi, 30 odd miles from Bangkok, barefoot, trouserless, dysentery, beriberi, no control, not happy. Who could be? It was each man for himself and his mate. Max had a pair of cotton trousers at this Chungkai camp on the big, beautiful river near Kamburi village. We sold these for him, gave him a dollar or two (for food), but his body could not take it. They were taking 1½ gallons of water out of his stomach a day before he died so reports said, lying on some low bamboo flooring. (There was) plenty to eat but all stews (were) rough on the bowels. Some bodies could take the unaccustomed food, some could not. A day or so before he died I asked the question about still wanting to be a missionary. He was not happy in the flesh but he still had this resolve. No pain, just gradually dropped into unconsciousness as so many others did. His death was classed as debilitation and beri beri. I was in one hut of 120 later on and about 90 could not take the food. (Their) bodies had weakened too far up the rail in the jungle or on the Burma railway. I see mentioned in my old Daily Reading (notes) which I scribbled on those years ago, out of the 3074 deaths of the 7000 in F Force, about 1040 dead were Australians, the rest English. Two were Padres, two were officers (one drowned himself, one committed suicide – he was sick when we carried him up and the O.R.s got the hiding). The record I got at the time was 3068 odd deaths compared with six Commissioned officers. Article put together by Lt Col Peter Winstanley OAM RFD Ret’d JP following telephone discussions with Frank Nankervis and the daughter of Sgt Hughes Mrs Stephanie Bladen and study of the book “Doctor’s Diary and Memoirs” by Roy Mills (out of print, unfortunately) .Mrs Margaret Webster, niece of the late Max Smith, assisted with providing copies of the Rex Marshall letters and preparation of the article. The sketches of the sick and the barge were done in 2006 by ex POW Fred Ransome Smith (Lt Fred (Smudger) Smith – 5th Suffolks). Fred Ransome Smith has 2 books of sketches about his POW experiences and can be purchased by Fred from 29 Seymour Grove, Brighton Beach, Victoria, 3186 Australia.